We had arrived at the House of the farm owners Janne and Stephen. After about 10 minutes of unpacking the cars Janne and Stephen came up in a tractor and quad bike. We lifted all of the heavy stuff like the chilly bin and Holly's tent and more inside a modded Suzuki called the ladybug and then after another 5 or more mins we had started to walk down the hill. We then stopped at the calf shed, the calves were very cute! then we continued to walk into the bush. After about what Michaela said was a 40 minute walk though it felt like 15 instead we arrived at the site we were staying at. we all felt the amazing relief of taking off our tramping packs and then found good spots to make our shelters. It took me a good 20 minutes to set up. Then Michaela said we could go for a swim. I think everyone was very excited about going for a swim but I think that changed after we felt the water and it was like 4 degrees but after about 25 minutes or more everyone had got in. So we all got dry then everyone helped to make the spag-bol. It was very nice. After dinner It was lights out and before we know it, it was the next day. Camp life was fun. We had tarps to sleep under and Cameron and Jim slid out from underneath their tarps because they were on a slope but other than that we were fine. The food was ok and it was funny watching Rohan make a fuss over the veggies on the night we had dehydrated food. On the first night we had spaghetti bolognese, which all of us enjoyed. On the morning of the second day we had pancakes for breakfast and for lunch we had sandwiches. On the second night, we had dehydrated food. On the morning of the third day we had cornflakes and for lunch we had noodles. For dinner, we had baked beans, sausages, and mince that Jan and Steve brought down. Splash! “ Ahhhhhhhh” Paige rose to the surface with a shriek. “Is it cold” I ask. “No,” Paige gives me the look “Of course not”. I don’t believe her but all the same, I leap into the biting water. I resurface panting in shock from the cold. I swim to the edge of the deep, murky waterhole and clamber out over the rocky edge shivering. Lyra jumps in, and comes back up without a sound, then gets out, quaking. The stream was FREEZING. Alex, an enviro-schools facilitator, came along to Wilderness Camp with the Ahurei Group. While she was here she guided us a stream study on the stream that was on the farm. We tested the stream’s temperature, PH, velocity, clarity, and flow. We had lots of fun with balls, thermometers, and much more. Thanks Alex! Among the many challenges we had on Camp was Meditation . . .in a FREEZING stream. The consisted of floating on our backs for 30 seconds. I’m not sure all of the Ahurei Group achieved this challenge, but I know everyone had a good laugh watching people attempt to do it. On our camp this year we had 2 hosts, 2 helpers and 1 princess. Our hosts, Janne and Stephen were the owners of the farm that we were camping on. They had done an excellent job creating a safe and fun environment for us and their farm was an excellent spot for our camp with a stream, rock climbing cliffs and lots of native bush. Our adult helpers, Michaela and Alex, were really helpful, doing helpful stuff like helping with our meals and setting up awesome activities for us to do. Our princess, Holly, was really helpful with telling us what to do and being funny. Our hosts and helpers really helped us have a fun, safe and educational experience. On wilderness camp we did rock climbing on Janne and Stephen's farm. 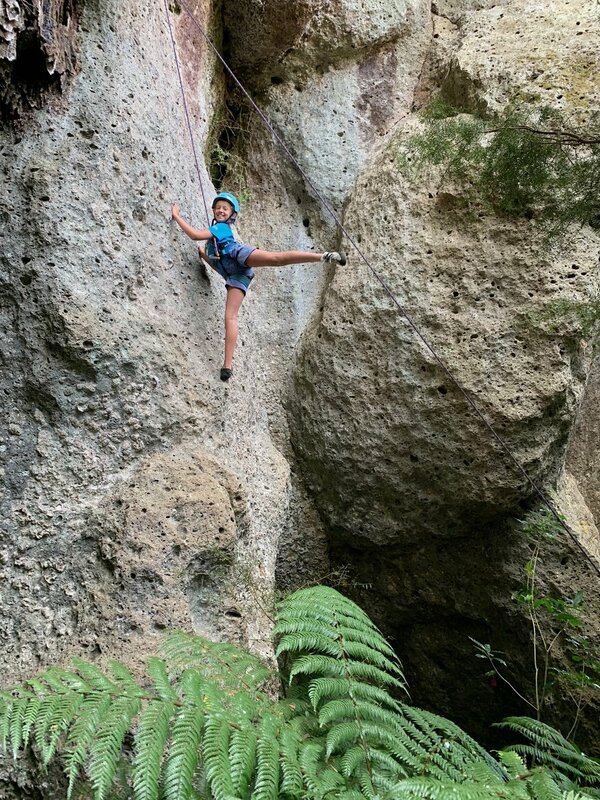 we climbed on naturally formed from volcanic explosions, and landed on a farm 35 minutes from Kihikihi, with natural holes and lumps for feet. This was a challenge for me and my shaky Adrenalin legs. I got to name a rock face because I was the first to climb it, I named it Ahurei, our year seven and eights group name, and it means unique in Te Reo Maori. I climbed 4 different walls, honey comb, a piece of cake, Ahurei, and take 5. All these walls had their specialties. Take 5 was by far the most challenging, and was level 15, out of levels up to 22 at that farm. Only Cameron, Jake, and Paige, me, climbed it. well, Holly the princess nearly got there. My favorite part of the rock climbing was being belayed down the rock face. It’s like abseiling, which I love. I think everybody is super happy with their accomplishments, even the adults! I believe this activity was well needed at our Te Miro Wilderness camp, as we are doing WPCA, the William Pike Challenge Awards, in years seven and eight. There were seven of us overall, and all took part in the rock climbing. The next Ahurei group can’t wait to do these activities, and will put in their all, like we did. Challenging ourselves, and working through all problems together. I would definitely recommend Shawthing Rock Climbing adventures Jan and Steve's farm to any outdoorsy person, or someone who wants to take up rock climbing, they have the best walls to climb I’ve seen yet. The go from easy to extremely hard, and they have quite the adventures to get to these hidden walls. We were all sitting in the community tent, I think we’d just stopped playing truth or dare. Ishel was sitting by one of the walls, and like all sun tents, which is what our community tent was, the walls didn’t properly reach the floor. The rest of us were scattered around the tent - Paige, and Rohan both somewhere in the middle, Jake by the same wall as Ishel, Jim opposite Ishel and Jake, Cameron beside Jake, and me directly opposite Ishel. From that gap between wall and grass came a little frog, right by Ishel. “Ribbit!” Ishel shrieks and the others start screaming. She scurries across the tent and somehow ends up on my lap. “What are we screaming about again?” Rohan asks. The frog ended up disappearing into Michaela's tent and we never saw it again. Jim was washing one of our tea towels in the water hole on the first morning when the current pulled it out of his grip and it sunk to the bottom of the pool, where we could only just see it. An Eel swam out from somewhere and grabbed the tea towel in its mouth, attempting to tug it into its cavern. Someone shouted for a stick and Cameron grabbed a huge one from his tarp tent. Somebody poked about in the water until the stick resurfaced with our tea towel on the end. We now knew that we were swimming with eels (although some of us knew before). Rohan and Cameron had set up a rope on a dirt bank near our camp, as they had decided that it would be ‘fun’ to climb down that way instead of using the path. Cameron had the first go and slipped, landing on top of some unfortunate ferns. Rohan double checked the rope and decided to hammer it in more. Cameron had climbed up the path, only to be accidentally shoved off by Rohan as he worked. Poor ferns! Karma then kicked in and Rohan fell down a 2-meter ditch. We were all standing on the edge of the stream, testing the water flow. Cameron had walked along and slipped down a hole between the rocks, drenching himself. Maybe 5 minutes later, Jake walked along the same rocks and… you guessed it - he fell in as well. Paige and Ishel had built their tarp tent by attaching it to a tree. They must have tied it too tightly, as, on the first night, it broke and decided to fall in on them while they were inside. Ishel shrieked, and both of them panicked. They fought their way out and then had to tie it back up in the dark. Poor them! The last night was a memorable one for all of us year 7 and 8’s. We got to roast marshmallows over a gas cooker. We crawled through a cave called the rabbit’s hole into a baby bulls paddock. We found cave wetters about 5 cm long. We had a nice barbecue with Jake’s parents and Jan and Steve. When it was late we were given rewards from Holy, then everyone had to go to bed. The next morning we had breakfast, packed our bags, and had to leave the campsite.